Time for a ride on the classic carousel horse for this lucky lady. The horse revolves to the tune, "Carousel Waltz." 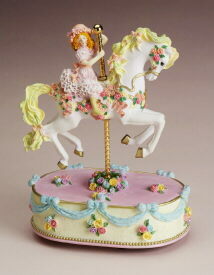 An exclusive addition to the Classic Carousel Collection. 6 1/2" x4 1/2" x 8 1/8"